Termites are extremely important in nature because they recycle fallen trees back into soil. Unfortunately, a termite cannot tell the difference between a pine log and a pine board. Termites cause more destruction to wood products and structures in homes than any other insect. Therefore, homeowners must understand termites and how they can be controlled. Termites are social insects that live in highly organized colonies. Like many insects, termites have an egg, an immature, and an adult stage. There are three main types of adults: reproductives, soldiers, and workers. The reproductives include the king and queen and supplementary reproductives that produce eggs. The soldiers protect the colony from attackers such as ants. Workers are the heart of the colony. 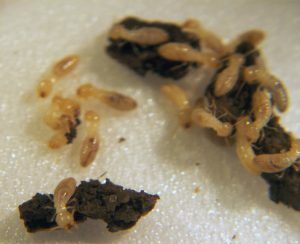 They clean and care for all the other termites and forage for food (wood and paper products). When a colony is several years old and relatively large, it may produce another form of adult termite called a "swarmer." Swarmers have four wings, are often brown or black, and range in size from approximately 1/4 to 3/8 inch. Swarmers are the colony's way of sending out new kings and queens to start colonies of their own. In the spring, great numbers of swarmers can fly from a single colony. Swarmers are the most visible form of termite. Usually a homeowner realizes termites are present in or around the home when a swarm is seen. Swarming termites can be confused with many ants that swarm in the spring. If you look closely, you can see that swarming ants have elbowed antennae, a narrow waist, and front wings that are longer than the back wings. Swarming termites have straight antennae, a thick waist, and all the wings are the same length. As their name indicates, subterranean termites usually live underground, excavating passageways to reach wood. Their passageways can be quite complex, extending 10 feet underground and over an acre in area. The soil provides a source of moisture that protects the termites from drying and shields them from predators. The soil also provides building materials for the protective shelter tubes the termites use to forage for wood above the ground. The best way to protect your home against termite attack is with a combination of prevention and inspection. Prevention The best control method is protecting your house from attack. For example, if you are building a new house, make sure there will be several inches (at least) between the soil and any lumber. This distance will force the subterranean termites to build shelter tubes, which are about the width of a pencil, from the ground to reach the wood in your house. The tubes make it easier to find and control areas where termites attack. When building, your contractor should remove all roots, stumps, grade stakes, scrap lumber, and other wood debris before your house is completed. After completion, continue to keep wood debris from collecting under or near your house, including piles of firewood. Homes built over a crawl-space should have good ventilation and possibly a vapor barrier to keep moisture levels low. The finished grade on all buildings should slope away from the foundation to keep water from collecting near the house. Proper construction and repair of gutters, roofs, pipes, and other potential sources of water for above-ground termite infestation are very important. You should also ask your contractor about additional building practices he or she plans to use to reduce the chance of termite infestation, such as capping foundation walls and using treated lumber. Chemical control insecticide treatments (termiticides) or termite baits must be used to control established termite colonies. Termiticides should be applied only by a certified pest control applicator. Successful termite treatments require many gallons of diluted soil termiticides applied with specialized equipment. Termiticide application at this level is beyond the ability of most homeowners. Baits that are placed in the soil around the home have shown a lot of promise in recent years. To protect your home, the environment, and yourself, employ a professional pest control company. Remember, your home is probably the most expensive purchase you will make in your lifetime. With a little time and a little knowledge, termite damage can be avoided. The amount of damage that wood-boring beetles cause depends on many factors. The type of wood (hardwood or softwood), the moisture of the wood, and the environmental conditions at the infestation site all affect the severity of beetle damage. Only the larvae damage wood. The female lays an average of twenty to fifty eggs in crevices or on the ends of boards. When they hatch, the tiny larvae bore down into the wood. As the larvae grow, they bore to a point just underneath the surface of the wood, there they change into adults. After they change, the adults cut a 1/32- to 1/16-inch circular exit hole in the surface of the wood. Often, powdery wood dust created by the beetle's feeding is pushed out as the adult beetle emerges. This is why they are called "powderpost" beetles. Males and females exit at the same time and mate, and the new generation of females lay eggs again. Borate sprays are the primary treatment for wood boring beetles. Once sprayed onto wood surfaces, the borate is absorbed by the wood. If beetles (or larvae) chew the wood, the borate is injested and they will die. This kind of treatment is also effective against termites and carpenter ants. 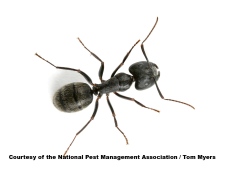 (1/4" - 1/2" long) Nesting in damp locations, carpenter ants prefer to excavate wood that has been damaged by water. From their nests in the beams, floors or walls, they scavenge the house for food crumbs and insects. Carpenter ants may occur in several colors, although the most important species are black. One of the largest members of the ant family, carpenter ants take their name from their habit of chewing passageways (called "galleries") inside wood. They live in these galleries and make excursions, most often at night, to hunt for food and water. These ants often set up satellite colonies inside homes from parent colonies located outside in a tree or landscape timber. Carpenter ants love damp climates and moist areas – damp wood, any dark void, a few morsels of food. Places that get a lot of rain are especially susceptible. So are homes built in heavily wooded areas or in low, shady places where the ground stays damp. In your home, you're likely to find carpenter ants nesting around a sink in the kitchen or bathroom. Maybe even around plumbing leaks, clogged gutters and downspouts. A clean house is no guarantee. When carpenter ants move in, the first thing they do is look for food. Unlike termites, carpenter ants do not eat wood. They search for syrup, honey, jelly, meat, fruit, grease, fat, and other domestic foods. If these favorites are not available in your home, the ants will feed on dead or living insects or any other type of organic matter. To construct their galleries, carpenter ants tear bits of wood and place them outside the nest. These sawdust-looking piles, called frass, may be the first visible sign that carpenter ants are present. Left unchecked for a period of time, these galleries can become quite large. While the primary nest is found in damp wood, carpenter ants establish many satellite colonies. This makes them difficult to control, especially since colonies may be found in any dark void- hollow curtain rods, hollow-core doors, ceilings, dead wall space, etc. Carpenter ants mature in about two months and immediately start enlarging the nest. First year broods are small, with only 10 to 20 workers. But in a few years, when the colony has thousands of workers, small tunnels become major expressways connecting many hidden galleries. You may not be aware that a strong colony is firmly entrenched in your home until it is too late. Listen for ant sounds in the quiet of the night. When the ants are chewing, or simply moving around in the nest, they make a sound like rustling cellophane. If you see or hear any of these signs, you may have carpenter ants. You need to have a well-constructed plan for dealing with carpenter ants. If you suspect carpenter ants have invaded your home, it's best to seek immediate treatment. Professionals make a thorough inspection of your home, inside and out. Depending on your home's construction and the location of the main nest and satellite colonies, these professionals will use a variety of methods to treat the problem. Treatments around the outside of the home along with some gel bait treatments inside are often used. Click here to watch carpenter ants devouring gel bait. This bait can bring a quick end to an ant colony! Pavement ants are small ants about 1/8th inch long and dark brown to black in color. They are found throughout the eastern half of the US and are a major pest in the upper Midwest. The name for this ant comes from its habit of nesting under sidewalks and driveways and piling dirt removed from the nest in a mound on top of the pavement. In addition to nesting under sidewalks, pavement ants colonies can be found under other items lying on top of the ground, including stones, logs, boards, bricks and patio blocks. They may nest in open soil close to building foundations or under mulch in landscaped beds. Only rarely do the ants nest indoors in walls, under floors or in insulation. Control of pavement ants should begin with an attempt to locate the nest site. Ants entering buildings from outdoors can be discouraged by sealing as many cracks and gaps in exterior walls as possible. Also, correct poor foundation drainage and repair water leaks. Odorous house ants are small ants about 1/8th inch long and dark brown in color. They are found throughout the US and in spite of their name, are only an occasional pest in the house. Their name comes from the disagreeable odor similar to the smell of rotten coconuts that is given off when the worker ants are crushed. Odorous house ants commonly nest outdoors in the soil under stones, logs, mulch, debris and other items. They will also nest indoors in wall and floor voids, particularly in moist or warm areas. If only a few workers (wingless ants) are observed in the house it is an indication that they are nesting outdoors and entering the house in search of food. 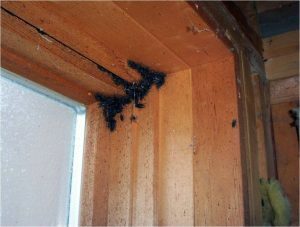 If winged swarmers are found indoors, or if workers are consistently seen in great abundance, it likely indicates they are nesting within the house. Control of odorous house ants should begin with an attempt to locate the origin of the ants. Careful and frequent observation may be necessary to develop an opinion about the source. Ants entering from outdoors can be discouraged by sealing as many cracks and gaps in exterior walls as possible. Pharaoh ants are very small in size, and light yellow to red in color with black markings on abdomen. Due to their extremely small size, they can be found in a diversity of places, appearing suddenly. They have a wide range of foraging and their nest are usually well hidden. They are very persistent, with large colonies. Inside they are usually found in the kitchen and bathrooms, but workers are seen trailing along window sills, and baseboards. They can also be spotted near sources of water in the kitchen and bathrooms, counter tops, toilets,drains and sinks. They prefer to nest in recessed areas like wall voids,under some appliance, wall outlets, under carpet for protection, but they can also nest outdoors in lawns and gardens. German cockroaches, are the most common roaches found in houses and restaurants in Western New York State. Most cockroaches have a flattened, oval shape, spiny legs, and long, filamentous antennae. Immature stages are smaller, have undeveloped wings and resemble the adults. They eat food of all kinds and may hitchhike into the house on egg cartons, soft drink cartons, sacks of potatoes or onions, used furniture, beer cases, etc. They can develop into large populations and live throughout the house, especially in the kitchen and bathroom. During the day, these roaches may be found hiding clustered behind baseboard molding, in cracks around cabinets, closets or pantries, and in and under stoves, refrigerators and dishwashers. When seen during the day in clusters, the population is large. Roaches can foul food, damage wallpaper and books, eat glue from furniture, and produce an unpleasant odor. Some homeowners are allergic to roaches. The pests can contaminate food with certain bacterial diseases that result in food poisoning, dysentery, or diarrhea. Wood cockroaches, also known as wood roaches, are common outdoor dwelling insects native to North America and found throughout Western New York State. Their normal habitat is moist woodland areas but they frequently become a household nuisance because they wander into or are carried into houses as "occasional invaders." They are common in wooded areas of the Finger Lakes, and in woodlots of Monroe County. 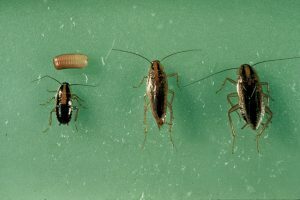 Wood roaches are very similar in appearance to the common household cockroach called the American roach; flat, oval body, long antennae, spiny legs, chestnut brown color. However, wood roaches are slightly smaller, about 3/4 to 1 1/4 inch long, and the adults, especially the males, appear tan because of the color of their wings. Adults and large nymphs of the wood roach can be recognized by a pale, creamy white or transparent stripe on the outer edge on the thorax. The pale edge extends onto the first 1/3 of the front wings of the adults. Positive identification of small nymphs is more difficult and usually requires microscopic examination. Wood roaches that have wandered into the house usually behave differently than the household roaches. Wood roaches are not secretive; they are active both during the day and at night and they are less likely to scamper out of sight when approached. Also, they will wander about the house without congregating in any particular location. Cluster flies are a nuisance fly invading houses in the fall and showing up inside on warm, sunny days in winter and spring. A little biology helps us to understand them better. Cluster Flies spend all their time feeding and reproducing outdoors. The larval stage is parasitic to earthworms, their only food source. The adult fly feeds on flowers. Eggs are laid in cracks of the earth where the larval stage emerges and attaches to earthworms. Several generations will occur from May through August. When evenings begin to cool in late August, Cluster Flies are attracted to the warm surfaces of buildings and take up shelter for the winter in wall voids and attics. There they sleep until unusual warmth in Fall and Winter wakes them. They then become a pest by "clustering" around windows and lights. Problems with Cluster Flies are most acute in rural areas where large open spaces exist. Old farmhouses are particularly prone to Cluster Flies, though it is due more to the abundance of earthworms and a "drafty" house than animal waste and farm odors. The biggest misconceptions about Cluster Flies can be corrected with understanding their life cycle. Their presence in a home is not due to unsanitary conditions. It is simply a place of hibernation - much like the cave to the bear. Keeping them out is better done by sealing openings than by cleaning up. House mice are occasionally found in fields, but usually in buildings. They will eat most anything and breed year round having as many as a dozen litters a year of 5-8 young each. Young are able to breed at six weeks. Because this mouse chooses to live near humans, it is considered a pest. The House Mouse is a known vector of various diseases, including Salmonella. The Norway Rat is more at home on the ground, but has been seen crossing from one building to another along a telephone wire, so it is an excellent climber. Around poultry houses, the rat feeds extensively on eggs and young chickens. It has even been known to kill lambs and young pigs! The Norway Rat is a source of food for the spotted skunk, barn owl and house cat, but because the rat is such a prolific breeder, these predators are often unable to keep the rat population in check. This rat is known to be a reservoir of bubonic plague, endemic typhus fever, rat bite fever, and a few other dreaded diseases. Therefore, buildings and garbage cans should be rat-proofed. Commonly called Deer Ticks, their actual name is Black Legged Tick. They have made it into the news over recent years because they are carriers of Lyme Disease, a potentially dibilitating infection passed on to humans through tick bites. Ticks are commonly found in low brush and tall grasses, and attach themselves to hosts as they pass by. They are usually picked up by hikers and pets along wooded trails, and low lying branches. Increased sightings have been found in Monroe County following the warm winter of 2012. Stinging insects can be much more than a nuisance - they can be life and death. Each year news is made from someone hospitalized from multiple bee stings. Pictured here is a Bald Faced Hornet's nest. These insects are black and white colored and live in suspended or hanging nests like this. They are agressive and easily angered. Yellow Jackets and Wasps are often missidentified. 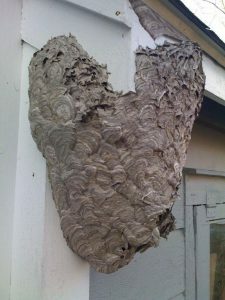 The open comb nests often found under eaves of homes, and in vents are Paper Wasps. These nests are relatively small with less than fifty insects per colony. Yellow Jackets are usually void nesters occupying attic spaces, walls, and holes underground. Like the Hornets they can be very aggressive, especially when alarmed by a lawn mower or human foot! Honeybees, Carpenter bees, and Bumble bees are the most common of the bees in Western New York. They are all pollinators, therefore beneficial to agriculture. When a Honeybee nest is found, it is best to contact a bee keeper first to see if the nest can be relocated. Carpenter bees are well known for the damage they do to wood trim and overhangs on structures. Bumble bees are often mistaken with Carpenter bees. Though they look similar, Bumble bees nest underground, under decks, and in wall voids of buildings. Of the social bees and wasps, Honeybees are the only ones that maintain the same nest from year to year. The rest are seasonal nesters. These bugs are harmless from the standpoint of biting, damage to the house, and food storage. But their prolific numbers on exterior siding and window frames can be alarming. Boxelder Bugs tend to be worst on the sunny side of buildings. They can be a problem throughout the Winter if they find a way in around windows. Like many occasional invaders, they are harmless and do not bite. Large numbers inside can be annoying. If they become an annual problem, treatments can be done outside in the fall to prevent their intrusion. Indian Meal Moth: The most common of moths found in food products, the indian meal moth damages food in its larval stage. They are small moths about 3/8" long, with distinctive dark wing tips. Adult moths are often seen resting on kitchen ceilings and flying near food products. Best known for infestations in grains, seeds and nuts, they can also be found in dried flowers and organic decorations in the home.